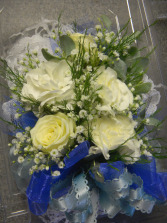 2 spray roses mixed with mini-carns, filler and a bow. 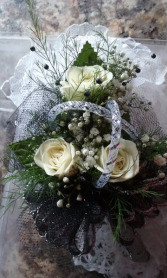 Wrist corsage with 3 spray roses, filler and a bow. 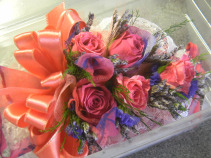 Choose from a variety of ribbons, accents, and colors of flowers. 4 spray roses with filler and a bow. Choose from a variety of colors, accents and ribbons. Wrist corsage with 5 spray roses, filler and a bow. Choose from a variety of accents and ribbons to match your dress! Wrist corsage with 5 spray roses, filler and a bow. Choose from a variety of ribbons and accents, even bring swatches of your dress to add in for that extra special touch! 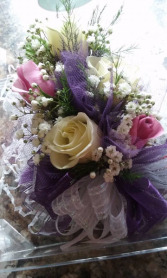 Lovely corsage of mixed flowers. Spray roses and alstroemeria. Corsage of mixed flowers. 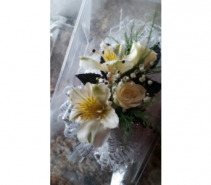 Choose from daisy pomps, alstroemeria and/or spray roses. Wrist corsage with 1 spray rose and mini-carnations, filler and a bow. Choose from a large selection of accents, ribbons, and flower colors. 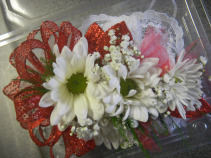 Mixture of miniature carnations filler and a bow. Call to place your order, or stop in so we can help you customize! Bring in the dress, a swatch, or you can even send us a picture to one of our phones. We take the time to show you flowers, ribbons, and accents to make you perfect corsage! We always have a variety of colors of miniature spray roses, mini-carns, standard roses and alstroemeria to choose from. calla lilies and other high-end flowers.